The cell membrane is important in regulating cell shape and the selective transport of molecules in and out of the cell. The nucleus is surrounded by a nuclear envelope, which contains nuclear pores and nuclear pore complexes which regulate the entry and exit of materials. Organelles are membrane-bound compartments that exist within most cell types. Organelle literally translates to ‘small organ’, reflecting their essential function in regulating the cell as a unit. 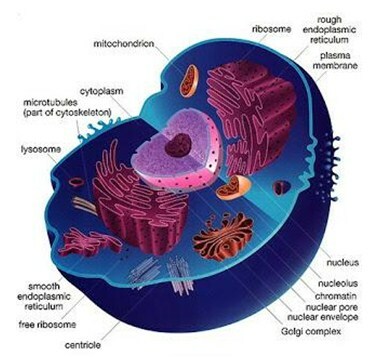 A eukaryotic cell contains various organelles that carry out specific functions. Whist not technically an organelle, the cell membrane is an important feature of cells and organelles. The cell membrane acts as a structural boundary between a cell and its environment, regulating the entry and exit of oxygen, water, amino acids, and ions into the cell. The plasma membrane is a double-layered structure consisting of proteins and phospholipids. 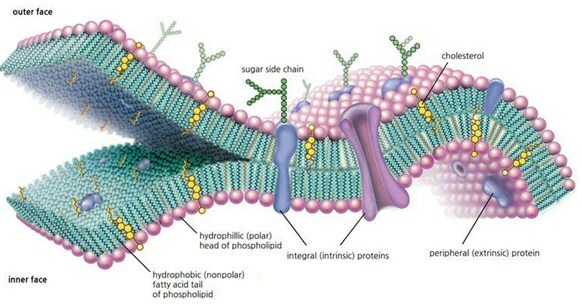 A phospholipid is a special type of lipid, made up of a phosphate head that is hydrophilic (water-loving), and two fatty acid tails that are hydrophobic (water-fearing). Phospholipids naturally form a double-layered structure with their hydrophobic tails pointing inward (towards each other, and away from any water) and their hydrophilic heads facing outward (towards the outside). This is called a phospholipid bilayer, and is found in many biological membranes. The resulting structure is said to be selectively permeable, allowing the entrance/exit of some molecules into the cell in order to maintain optimal conditions inside. The phospholipid bilayer is an important structural component of the plasma membrane. However, most of the functions are carried out by embedded membrane proteins. These proteins carry out specific functions, such as transport of molecules into and out of the cell. Carbohydrates and cholesterol can also be found on the cell membrane. The presence of these additional components allows the membrane to carry out important signalling processes by sensing the external environment. The cytoplasm is a thick semi-fluid substance that fills each cell. It is enclosed by the cell membrane, but excluded from the nucleus. It contains all the other organelles. Cytoplasm is mainly composed of water, and also contains salts, amino acids, nucleic acids and sugars. The high protein content of the cytoplasm gives it the gel-like texture. The part of the cytoplasm that is not contained within the organelles is called the cytosol (i.e. the space between the organelles). Although the liquid nature of the cytoplasm may suggest that it has no structure or organisation, it is actually highly regulated and specialised. A network of of protein scaffolds called the cytoskeleton provides the cytoplasm and the cell with structure, as well as providing mechanical support for various cellular processes. The genetic information is stored in a large, spherical organelle named the nucleus. The tight regulation of the structure and function of the nucleus is very important in allowing the eukaryotic cell to have such complexity compared to prokaryotes. Inside the nucleus, DNA is folded up into a complex molecule called chromatin, which is further organised into chromosomes. These chromosomes are stored in the nucleoplasm, which is a matrix similar to the cytoplasm. 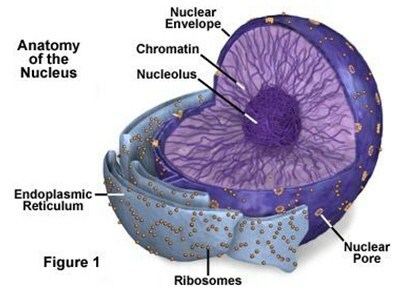 The nucleus is surrounded by double layered membrane called the nuclear envelope. This membrane is made up of two lipid bilayers: the inner nuclear membrane and the outer nuclear membrane, and provides a selective barrier between the nucleus and the cytoplasm. The outer membrane is connected to the membrane of another organelle, called the endoplasmic reticulum, which is important in transporting proteins in the cell. The nuclear envelope is very important in keeping the DNA separated from the environment of the cytosol, in order to protect the important information contained within it. However, there is also the need for materials, such as proteins and ions, to enter and exit the nucleus in a regulated manner. To allow substances to transport in and out of the nucleus, small channels exist throughout the membrane. These are called nuclear pores, and span the nuclear envelope. To regulate what comes in and out of the nucleus, huge complexes called nuclear pore complexes are embedded within the envelope. Another important feature of the nucleus is the nucleolus. It is a large, prominent structure and is mainly involved in the synthesis of ribosomes. Ribosomes are one of the few organelles found in both prokaryotes and eukaryotes. They are crucial for the function of practically every cell, because they are the organelles responsible for synthesising proteins. They consist of RNA and proteins, and are made up of two subunits, large and small. The large subunit sits on top of the small subunit, with an RNA template between the two protein components. Eukaryotic ribosomes may be either free, meaning that they are floating around in the cytoplasm, or bound, meaning that they are attached to the endoplasmic reticulum or the outside of the nuclear envelope. The ribosome works like a machine, constructing long chains of amino acids together to form proteins based on the instructions coming from the nucleus in the form of an mRNA. When the ribosome makes the protein, the two subunits enclose the Mrna between them. The amino acids that are to be connected together by the ribosome are attached to tRNAs. 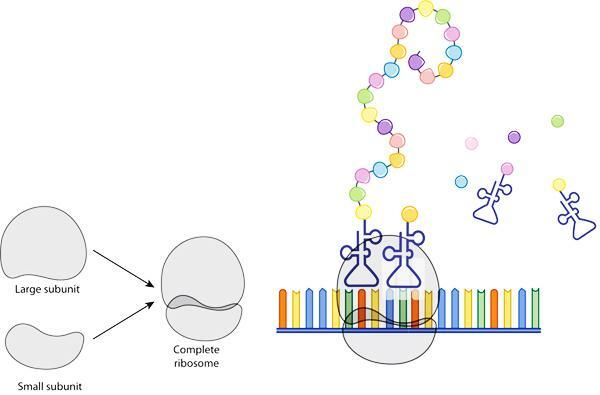 The ribosome connects to specific tRNAs based on the instructions encoded in the mRNA. The tRNA detaches from the amino acid, and the ribosome links together many amino acids form a polypeptide chain, that eventually forms a mature protein. This process is called translation of the mRNA. The endoplasmic reticulum can be sub-divided into the rough endoplasmic reticulum and the smooth endoplasmic reticulum and is responsible for protein processing. Chloroplasts are the site of photosynthesis and are specific to plant cells, as is the plant cell wall. The components of organelles are distinct for different cell types that perform different functions. The endoplasmic reticulum (ER) is an important organelle found in eukaryotic cells. It is a network of membrane-enclosed tubules and sacs called cisternae, and is crucial for the production of macromolecules such as fats and proteins. Often the products of the endoplasmic reticulum are transported to other organelles, or released into the extracellular environment.. Importantly, the membrane of the ER is continuous with the nuclear envelope, providing a streamlined point of access between the nucleus and the organelles of the cytoplasm. There are two distinct regions of the ER, the rough endoplasmic reticulum and the smooth endoplasmic reticulum,. The rough ER is named as such because its outer surface is coated with ribosomes, and appears rough under a microscope. The smooth ER lacks these ribosomes. The smooth ER is responsible for a variety of metabolic processes in the cell, including synthesising and storing hormones, and breaking down drugs to remove their toxic properties. The ribosomes on the rough ER are responsible for the synthesis of various proteins. After the amino acid chain is synthesised in the ribosomes, it is moved to the rough ER. The ER membrane keeps these proteins separate from the other proteins that are produced by the free ribosomes in the cytosol. The ER continues the process of protein synthesis, by adding modifications and packaging it into a more structured protein. 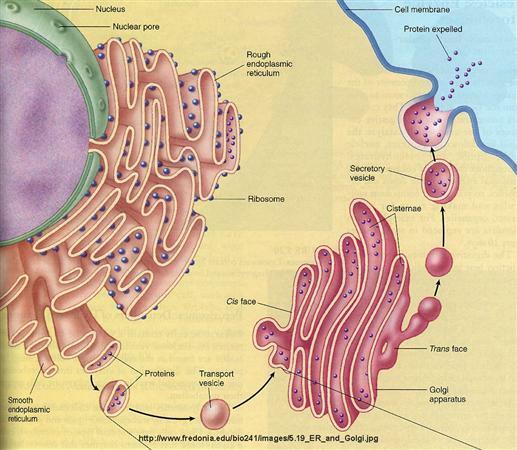 The proteins of the ER are usually then passed onto the Golgi apparatus, through small sacs called transport vesicles. Different cell types with different requirements will have variations in how much of smooth/rough ER they have and different emphasis in their roles. For example, there is an emphasis on smooth ER function in the cells of the liver, which are important in removing toxins from the body. The Golgi apparatus (sometimes called the Golgi body, named after the Italian physician who discovered it) is important for processing, modifying, packaging and transporting macromolecules such as proteins and hormones. It is often thought of something similar to a sorting centre in a post office. The Golgi apparatus is also a membrane-rich organelle, continuous with the ER. Similarly, it also consists of cisternae and sacs, but these are fewer in number, disc-shaped, and prominent in the cell. When the ER has synthesised a protein, the vesicle can ‘bud’ off and make its way to the Golgi, which absorbs the product. The Golgi finishes the work of the ER by, for example, editing the addition of carbohydrates to glycoproteins or altering the composition of membrane phospholipids. The Golgi can also make certain macromolecules by itself such as polysaccahrides. Together, the Golgi apparatus and the ER are often referred to as the endomembrane system, reflecting their highly membranous structures. A lysosome is a specialised vesicle that contains enzymes that breakdown macromolecules, ingested substances and organelles in an animal cell. The enzymes are created by the Golgi body, and the vesicle is pinched off and released into the cytoplasm, where the lysosome can carry out intracellular digestion. This works to digest complex sugars and proteins, as well as recycling the cell’s own products such as damaged organelles. Mitochondria are cytoplasmic organelles and the sites of cellular respiration. They generate energy by breaking down sugars and fats using oxygen. A cell usually has hundreds or thousands of mitochondria, depending on how metabollically active the cell type is. The mitochondrion has two membranes which are both phospholipid bilayers. The outer membrane is smooth, but the inner membrane is intricately shaped, with various foldings called cristae. The space between the two membranes is called the intermembrane space, the centre of the ribosome enclosed by the inner membrane is called the mitochondrial matrix, containing important enzymes for respiration, as well as the mitochondrial DNA and ribosomes. The enzymes that are found in the mitochondrial matrix are crucial in cellular respiration, and the folding surface of the cristae means there is a large surface area on which respiration can be carried out. 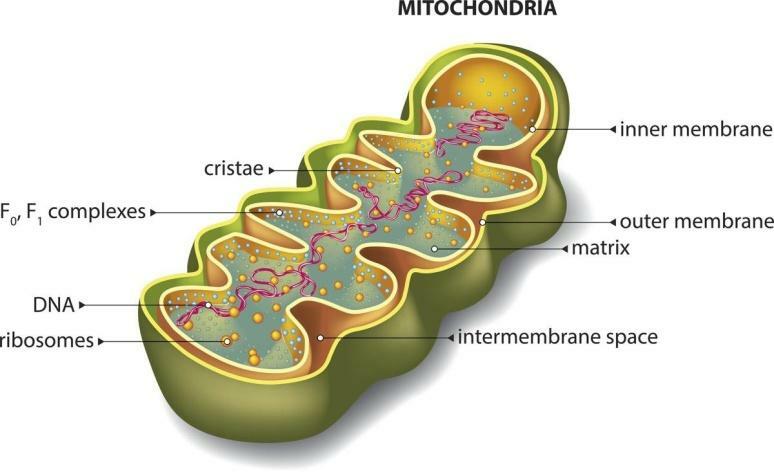 Mitochondria are interesting organelles because they act almost independently of the cell; they have their own genome, and even divide independently. In fact, mitochondria are thought to have arisen when an early version of a eukaryotic cell engulfed a prokaryote and utilised it to create energy for the cell! This is a way to explain how mitochondria are so similar to some modern prokaryotes. Chloroplasts are a highly specialised organelle almost exclusively found in plants. They are the sites of photosynthesis, where light energy is converted into chemical energy. Chloroplasts contain the green pigment chlorophyll, as well as other enzymes that are key to producing sugar. They are also surrounded by two membranes, similar to the mitochondria.